To keep in touch with our customers, there is a tab called CENTRUM POMOCI in Storyous POS application. Through this section you can communicate with your support team, report bug or additionally update your application. Each tablet is for safety reasons assign to exactly one place. So in case of Place changeor in case of unknown bug in application, deletion of app data can help with this problem. Please respect the fact, the you need to report the bug previously or consult the situation with our support team. Deletion of app data will not affect open accounts on tables or place settings. Only undesirable data will be deleted. To delete data you need unique code. The code gives you our support team after previous consultation. Please note that you need internet connection to enter the code and you need to control, that there is no notice about nonsynchronized bills in the app. After Data deletion all these bills will be deleted. Note: Nonsynchronized bills are not reported in the Storyous web administration. To safe the ticket and take a photo of it is apprecited. So if there is such a problem continue as follows: Click on the button in the top left corner, and choose - Centrum pomoci and then Nahlásit chybu. Then the field for the message for our development team occures. Fill the message and click OK.
Now you have the possibility to chat wit customer heroes directly from tablet. 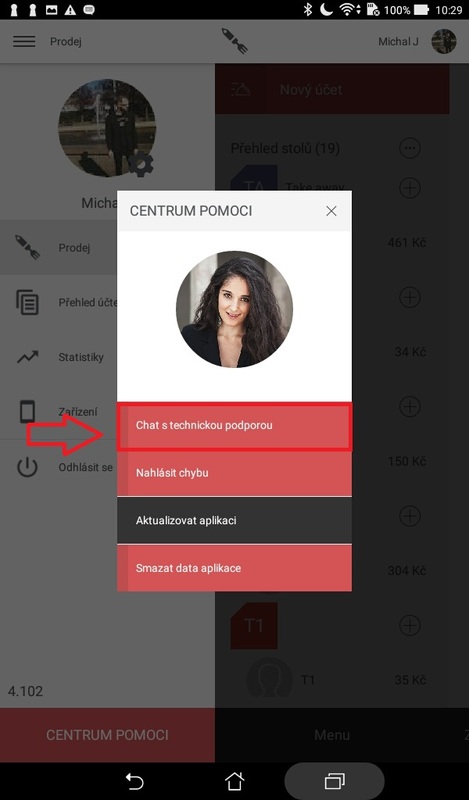 Click on the button in the top left corner, choose centrum pomoci and then chat se zákaznickou podporou. So you can report any problems you have and you do not have to wait on phone. We are updation Storyous app constantly as we are adding new functions. The possibilty to update appears after login as a text ,,what is new in POS/Vylepšili jsme aplikaci Storyous". If you have no time for the update, you can update it later again in centrum pomoci - Aktualizovat aplikaci. We highly recommend our customer to make the update regularly. And have the same versions on all tablets.